I have another skirt to share. I found this sheer polyester fabric for $1.50 a yard. I love the colors and the print, but don't really enjoy sewing this type of fabric. I purchased the fabric without a particular project in mind, but I knew that whatever it was that I made would have to be simple. I wanted to keep the number of seams to a minimum. I cut out a simple two rectangle panels for the skirt, and the lining. I then sewed the side seams, hemmed the bottom edges with a narrow rolled hem, gathered the waist slightly, and attached it to an elastic waistband. I picked up the navy elastic at Joann's. I wish that it were a bit wider, but it does the job. 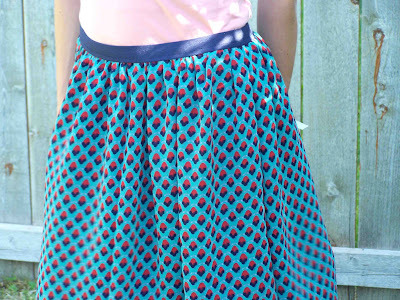 The skirt falls just below the knee, and the lining is about 2 inches shorter than the skirt fabric. Sheer polyester fabrics like this can snag and pull easily when working with them. I recommend using Sharp needles when working with it. Oh so pretty! Looks perfect for summer! Thanks for the sharp needle trick. I picked up some chiffon like fabric a while ago with no set plans, mostly b/c I've never sewn anything like it. 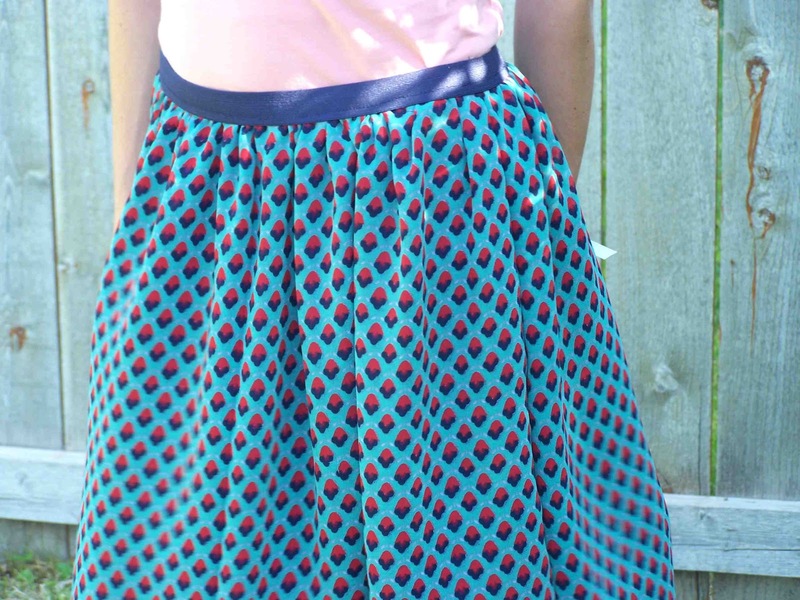 gorgeous skirt - love that material! Will have to keep the sharp needle idea in the back of my head for next time.